A pharmaceutical drug (also referred to as a medicinal product, medicine, medication, or medicament) is a drug used to diagnose, cure, treat, or prevent disease. Drug therapy (pharmacotherapy) is an important part of the medical field and relies on the science of pharmacology for continual advancement and on pharmacy for appropriate management. Drugs are classified in various ways. One of the key divisions is by level of essential medicines. Drug discovery and drug development are complex and expensive endeavors undertaken by pharmaceutical companies, academic scientists, and governments. Governments generally regulate what drugs can be marketed, how drugs are marketed, and in some jurisdictions, drug pricing. Controversies have arisen over drug pricing and disposal of used drugs. Pharmaceutical or a drug is classified on the basis of their origin. Drug from natural origin: Herbal or plant or mineral origin, some drug substances are of marine origin. Drug derived from chemical synthesis. Drug derived from animal origin: For example, hormones, and enzymes. Drug derived from radioactive substances. One of the key classifications is between traditional small molecule drugs, usually derived from chemical synthesis, and biologic medical products, which include recombinant proteins, vaccines, blood products used therapeutically (such as IVIG), gene therapy, and cell therapy (for instance, stem cell therapies). Pharmaceutical or drug or medicines are classified in various other groups besides their origin on the basis of pharmacological properties like mode of action and their pharmacological action or activity, such as by essential medicines. Pharmaceuticals may also be described as "specialty", independent of other classifications, which is an ill defined class of drugs that might be difficult to administer, require special handling during administration, require patient monitoring during and immediately after administration, have particular regulatory requirements restricting their use, and are generally expensive relative to other drugs. Drugs affecting the central nervous system include: Psychedelics, hypnotics, anaesthetics, antipsychotics, antidepressants (including tricyclic antidepressants, monoamine oxidase inhibitors, lithium salts, and selective serotonin reuptake inhibitors (SSRIs)), antiemetics, Anticonvulsants/antiepileptics, anxiolytics, barbiturates, movement disorder (e.g., Parkinson's disease) drugs, stimulants (including amphetamines), benzodiazepines, cyclopyrrolones, dopamine antagonists, antihistamines, cholinergics, anticholinergics, emetics, cannabinoids, and 5-HT (serotonin) antagonists. It can be performed in various dosage forms such as pills, tablets, or capsules. In the fields of medicine, biotechnology and pharmacology, drug discovery is the process by which new candidate drugs are discovered. Historically, drugs were discovered through identifying the active ingredient from traditional remedies or by therapeutic effect in a process known as classical pharmacology. Since sequencing of the human genome which allowed rapid cloning and synthesis of large quantities of purified proteins, it has become common practice to use high throughput screening of large compounds libraries against isolated biological targets which are hypothesized to be disease modifying in a process known as reverse pharmacology. Hits from these screens are then tested in cells and then in animals for efficacy. Even more recently, scientists have been able to understand the shape of biological molecules at the atomic level, and to use that knowledge to design (see drug design) drug candidates. Depending upon the jurisdiction, drugs may be divided into over-the-counter drugs (OTC) which may be available without special restrictions, and prescription drugs, which must be prescribed by a licensed medical practitioner. The precise distinction between OTC and prescription depends on the legal jurisdiction. 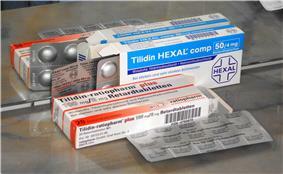 A third category, "behind-the-counter" drugs, is implemented in some jurisdictions. These do not require a prescription, but must be kept in the dispensary, not visible to the public, and only be sold by a pharmacist or pharmacy technician. Doctors may also prescribe prescription drugs for off-label use - purposes which the drugs were not originally approved for by the regulatory agency. The Classification of Pharmaco-Therapeutic Referrals helps guide the referral process between pharmacists and doctors. In the UK the Pharmaceutical Price Regulation Scheme is intended to ensure that the National Health Service is able to purchase drugs at reasonable prices. In Canada, the Patented Medicine Prices Review Board examines drug pricing, compares the proposed Canadian price to that of seven other countries and determines if a price is excessive or not. In these circumstances, drug manufacturers must submit a proposed price to the appropriate regulatory agency. *Sales are for the 12 months preceding 30 June 2011. Antibiotics first arrived on the medical scene in 1932 thanks to Gerhard Domagk; and coined the "wonder drugs". The introduction of the sulfa drugs led to a decline in the U.S. mortality rate from pneumonia to drop from 0.2% each year to 0.05% by 1939. Antibiotics inhibit the growth or the metabolic activities of bacteria and other microorganisms by a chemical substance of microbial origin. Penicillin, introduced a few years later, provided a broader spectrum of activity compared to sulfa drugs and reduced side effects. Streptomycin, found in 1942, proved to be the first drug effective against the cause of tuberculosis and also came to be the best known of a long series of important antibiotics. A second generation of antibiotics was introduced in the 1940s: aureomycin and chloramphenicol. Aureomycin was the best known of the second generation. Premarin (conjugated estrogens, introduced in 1942) and Prempro (a combination estrogen-progestin pill, introduced in 1995) dominated the hormone replacement therapy (HRT) during the 1990s. HRT is not a life-saving drug, nor does it cure any disease. HRT has been prescribed to improve one's quality of life. Doctors prescribe estrogen for their older female patients both to treat short-term menopausal symptoms and to prevent long-term diseases. In the 1960s and early 1970s more and more physicians began to prescribe estrogen for their female patients. between 1991 to 1999, Premarin was listed as the most popular prescription and best-selling drug in America. The first oral contraceptive, Enovid, was approved by FDA in 1960. Oral contraceptives inhibit ovulation and so prevent conception. Enovid was known to be much more effective than alternatives including the condom and the diaphragm. As early as 1960, oral contraceptives were available in several different strengths by every manufacturer. In the 1980s and 1990s an increasing number of options arose including, most recently, a new delivery system for the oral contraceptive via a transdermal patch. In 1982, a new version of the Pill was introduced, known as the "biphasic" pill. By 1985, a new triphasic pill was approved. Physicians began to think of the Pill as an excellent means of birth control for young women. Stimulants such as Ritalin (methylphenidate) came to be pervasive tools for behavior management and modification in young children. Ritalin was first marketed in 1955 for narcolepsy; its potential users were middle-aged and the elderly. It wasn't until some time in the 1980s along with hyperactivity in children that Ritalin came onto the market. Medical use of methlyphanidate is predominately for symptoms of attention deficit/hyperactivity disorder (ADHD). Consumption of methylphenidate in the U.S. out-paced all other countries between 1991 and 1999. Significant growth in consumption was also evident in Canada, New Zealand, Australia, and Norway. Currently, 85% of the world's methylphanidate is consumed in America. The first minor tranquilizer was Meprobamate. Only fourteen months after it was made available, meprobamate had become the country's largest-selling prescription drug. By 1957, meprobamate had become the fastest-growing drug in history. The popularity of meprobamate paved the way for Librium and Valium, two minor tranquilizers that belonged to a new chemical class of drugs called the benzodiazepines. These were drugs that worked chiefly as anti-anxiety agents and muscle relaxants. The first benzodiazepine was Librium. Three months after it was approved, Librium had become the most prescribed tranquilizer in the nation. Three years later, Valium hit the shelves and was ten times more effective as a muscle relaxant and anti-convulsant. Valium was the most versatile of the minor tranquilizers. Later came the widespread adoption of major tranquilizers such as chlorpromazine and the drug reserpine. In 1970 sales began to decline for Valium and Librium, but sales of new and improved tranquilizers, such as Xanax, introduced in 1981 for the newly created diagnosis of panic disorder, soared. antiseptic practice and the use of anaesthetics. Garcia de Orta described some herbal treatments that were used. Medicines commonly used by the late 1920s included aspirin, codeine, and morphine for pain; digitalis, nitroglycerin, and quinine for heart disorders, and insulin for diabetes. Other drugs included antitoxins, a few biological vaccines, and a few synthetic drugs. In the 1930s antibiotics emerged: first sulfa drugs, then penicillin and other antibiotics. Drugs increasingly became "the center of medical practice". :22 In the 1950s other drugs emerged including corticosteroids for inflammation, rauwolfia alkaloids as tranqulizers and antihypertensives, antihistamines for nasal allergies, xanthines for asthma, and typical antipsychotics for psychosis. :23–24 As of 2007, thousands of approved drugs have been developed. Increasingly, biotechnology is used to discover biopharmaceuticals. Recently, multi-disciplinary approaches have yielded a wealth of new data on the development of novel antibiotics and antibacterials and on the use of biological agents for antibacterial therapy. In the 1950s new psychiatric drugs, notably the antipsychotic chlorpromazine, were designed in laboratories and slowly came into preferred use. Although often accepted as an advance in some ways, there was some opposition, due to serious adverse effects such as tardive dyskinesia. Patients often opposed psychiatry and refused or stopped taking the drugs when not subject to psychiatric control. In 2013, BioMarin Pharmaceutical was at the center of a high profile debate regarding expanded access of cancer patients to experimental drugs. Recent studies have found that most of the medicines on the WHO essential medicines list, outside of the field of HIV drugs, are not patented in the developing world, and that lack of widespread access to these medicines arise from issues fundamental to economic development - lack of infrastructure and poverty. Médecins Sans Frontières also runs a Campaign for Access to Essential Medicines campaign, which includes advocacy for greater resources to be devoted to currently untreatable diseases that primarily occur in the developing world. The Access to Medicine Index tracks how well pharmaceutical companies make their products available in the developing world. TRIPS Agreement and the Doha Declaration, have centered on issues at the intersection of international trade in pharmaceuticals and intellectual property rights, with developed world nations seeking strong intellectual property rights to protect investments made to develop new drugs, and developing world nations seeking to promote their generic pharmaceuticals industries and their ability to make medicine available to their people via compulsory licenses. The environmental impact of pharmaceuticals and personal care products is controversial. PPCPs are substances used by individuals for personal health or cosmetic reasons and the products used by agribusiness to boost growth or health of livestock. PPCPs comprise a diverse collection of thousands of chemical substances, including prescription and over-the-counter therapeutic drugs, veterinary drugs, fragrances, and cosmetics. PPCPs have been detected in water bodies throughout the world and ones that persist in the environment are called Environmental Persistent Pharmaceutical Pollutants. The effects of these chemicals on humans and the environment are not yet known, but to date there is no scientific evidence that they have an impact on human health. ^ Spatz I, McGee N (25 November 2013). "Specialty Pharmaceuticals". Health Policy Briefs. ^ Finkel, Richard; Cubeddu, Luigi; Clark, Michelle (2009). Lippencott's Illustrated Reviews: Pharmacology 4th Edition. Lippencott Williams & Wilkins. pp. 1–4. ^ Anson, Blake D.; Ma, Junyi; He, Jia-Qiang (1 May 2009). "Identifying Cardiotoxic Compounds". Genetic Engineering & Biotechnology News. TechNote 29 (9) (Mary Ann Liebert). pp. 34–35. ^ Steven M. Paul, Daniel S. Mytelka, Christopher T. Dunwiddie, Charles C. Persinger, Bernard H. Munos, Stacy R. Lindborg & Aaron L. Schacht (2010). "How to improve R&D productivity: the pharmaceutical industry's grand challenge". Nature Reviews Drug Discovery 9 (3): 203–214. ^ Whitney, Jake (February 2006). "Pharmaceutical Sales 101: Me-Too Drugs". ^ "Chemical & Engineering News: Top Pharmaceuticals: Prontosil". ^ Dowling HF (June 1972). "Frustration and foundation. Management of pneumonia before antibiotics". JAMA 220 (10): 1341–5. ^ H. F. J. Horstmanshoff, Marten Stol, Cornelis Tilburg (2004), Magic and Rationality in Ancient Near Eastern and Graeco-Roman Medicine, p. 99, Brill Publishers, ISBN 90-04-13666-5. ^ Heinrich Von Staden, Herophilus: The Art of Medicine in Early Alexandria (Cambridge: Cambridge University Press, 1989), pp. 1-26. ^ Everett, Nicholas; Gabra, Martino (2014-08-08). "The pharmacology of medieval sedatives: the "Great Rest" of the Antidotarium Nicolai". Journal of Ethnopharmacology 155 (1): 443–449. ^ Miller, AA; Miller, PF (editor) (2011). Emerging Trends in Antibacterial Discovery: Answering the Call to Arms. ^ Helene S (2010). "EU Compassionate Use Programmes (CUPs): Regulatory Framework and Points to Consider before CUP Implementation". Pharm Med 24 (4): 223–229. ^ Phillips, Lisa (4 September 2008). "Contract Law and Ethical Issues Underscore the Latest Lawsuit About Access to Experimental Drugs for Duchenne Muscular Dystrophy" (PDF). ^ a b Banta D.H. (2001). "Worldwide Interest in Global Access to Drugs". Journal of the American Medical Association 285 (22): 2844–46. ^ Ferreira L (2002). "Access to Affordable HIV/AIDS Drugs: The Human Rights Obligations of Multinational Pharmaceutical Corporations". Fordham Law Review 71 (3): 1133–79. ^ Barton J.H., Emanuel E.J. (2005). "The Patents-Based Pharmaceutical Development Process: Rationale, Problems and Potential Reforms". Journal of the American Medical Association 294 (16): 2075–82. ^ "Misguided Policy on Patents". http://www.gphaonline.org/. Retrieved 08 Oct. 2015.